Loves Rubberstamps Blog: Happy Mother's Day! Hello! Hope everyone's having a great Saturday and for those of you celebrating Mother's day that it is a fantastic weekend! 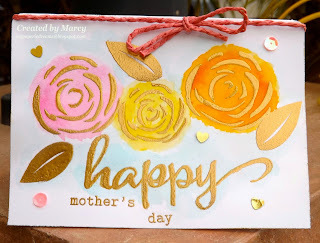 Today's I have a simple Mother's Day card I've made in celebration of this special holiday! I had recently picked up some Wow embossing powder in Gold Rich Pale and I couldn't wait to play with it because I really love the tone of this gold color. I used my Versamark ink to stamp some flowers and leaves from a set called Contemporary Roses by My Favorite Things. I then water colored over them with some Tim Holtz distress inks. I really soft colors against the gold. I added Wink of Stella over the flowers and you can't really tell from the photo but there is tons of pretty sparkle here! To finish off my card, I added some sequins including the fun heart ones from Pretty Pink Posh. I also tied some pink jute rope in a bow for a bit more splash of color! Happy Mother's Day friends and thanks so much for stopping by!